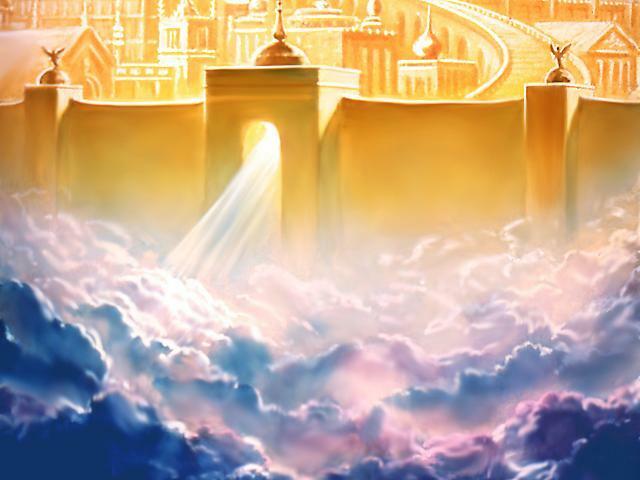 In the Kingdom of Heaven, we could see the New Jerusalem which the Bible tells us about in John 14:2, "In My Father's house are many dwelling places. If this were not so, I would have told you. For I am going away to prepare a place for you." We could see the city and enter it; it is a real and wonderful city! Jesus went there to prepare those dwelling places for us. In the city and we could see that each residences or house had the owner's name written in front of the house. This city is not yet inhabited, but it is ready for us. We were allowed to go inside the houses and see all the things inside. But later when we left the city, we forgot the things we saw, those memories were taken away from us. However, we can remember that the columns of the houses are plated with precious metals and have many different types of precious stones encrusted in them. They also have pure gold in them. After this, we were taken to a place that had lots of containers. Inside those containers were crystallized tears. Those were the tears that the sons of God shed on the Earth. They were not tears of complaints, but tears that people shed when they are in the presence of God; tears of repentance, tears of gratitude. God keeps these tears as a precious treasure in Heaven, just like it is mentioned in Psalms 56:8, "Thou takest note of my roaming; and put my tears into Thy bottle; are they not in Thy book?" We also came to a place where many many angels were. Although in Heaven we could see many different types of angels, this place had just one special type. We saw that Jesus, has a specific angel for each person. He also showed us that this angel will be close to us during our entire existence. He introduced us to the angels assigned to us. We got to see their characteristics, but God told us that we are not allowed to reveal these things to others. We read in Psalms 91:11, "For He gives His angels orders regarding you, to protect you wherever you go." We came to a place with many lockers, within them were many different flowers. Some flowers were open, beautiful and radiant. But other were kind of droopy, and some others ones were even shriveled. We asked Jesus what the meaning of all those flowers were? He answered, "It is because the life of each of you is like one of these flowers." He took one of the radiant flowers and said, "This flower shows the condition of the communion that you have with Me." He left that flower and took another one that was down. He said, "Look, this person is down because they are having a trial, or a difficulty. There is something in this life that is interrupting the communion with Me. Do you know what I do with these flowers when they are down in order to make them brilliant and healthy again?" He then took the flower in His hand and said, "I shed my tears over them and I raise them up." We saw how in a powerful way this flower began to have life again and raise up and its colors began to appear again. When we left there, we saw a beautiful castle very far in the distance. Nobody dared to get close to that castle, and we believe that is what the Scriptures talk about in Revelation 22:1, "He then showed me the river of the water of life, as clear as crystal, flowing forth from the throne of God and of the Lamb." We believe that the castle was probably located near the presence and throne of God. While experiencing all these things in the Kingdom of Heaven, we had so much joy in our hearts, we had a peace that passes all understanding. (Philippians 4:7) We understood as it is written in 1 Peter 1:4, "to an inheritance imperishable , unsullied, and unfading that is kept safely in heaven for you."